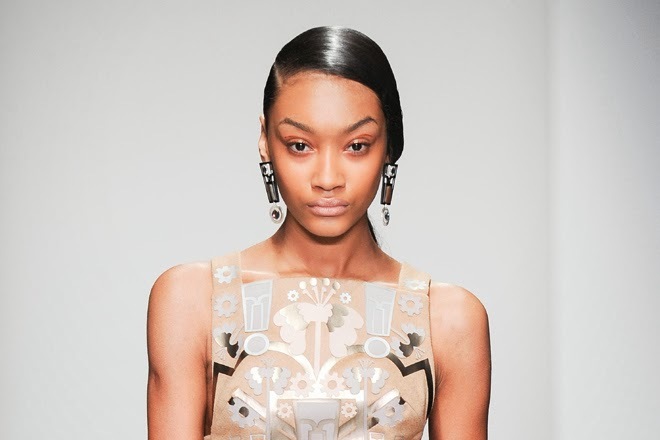 With London Fashion Week AW14 came a bevy of hot new hairstyles that we can’t wait to try out ourselves. So when Guy Cammarano, creative director at Regis Salons, offered us an insight into next season’s hottest hair trends and how to replicate these catwalk hairstyles, we couldn't refuse. Getting the look is easier than you might think, so get experimenting and create these catwalk-ready styles at home. 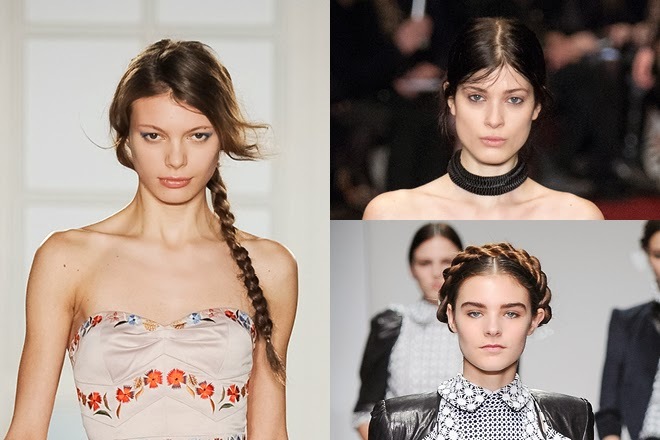 Plaits were big news at London Fashion Week, making an appearance in various forms. 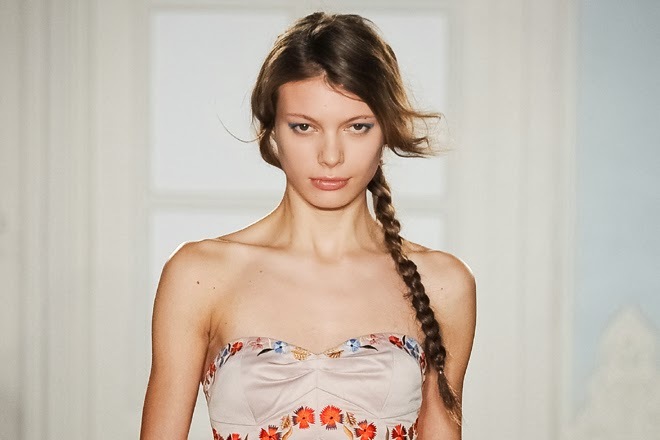 But Cammarano’s top trend tip for autumn/winter 2014 is the side plait, demonstrated beautifully at Temperley London. The side plait works best on day-old, dry hair – just run a brush through it to remove any tangles, then apply a texturising product to mattify the hair and keep it in place (Cammarano recommends Wella SP Style Refined Texture). Make sure you only use a small amount of texturiser otherwise hair can become greasy and difficult to manage. Simply rub it between your hands then run through the hair using your fingers. With your hair in a side parting, pull the length of your hair round to one side and tie it loosely at the nape of the neck using a thin hairband. This hairband will be cut out later but by tying it in place it creates a cleaner look at the end. Plait the hair as normal by dividing the ponytail into three sections and working your way down to the ends of the hair, tying in place at the end with another thin hairband. To finish, carefully cut the top hair elastic out of the hair then use your fingers to tease out parts of the plait to add volume and depth. Cammarano told us that his favourite look at London Fashion Week was Bora Asku’s elegant braid and we can’t help but agree. This look is intricate and demure and the good news is, it’s deceptively easy to create. Tie your hair into two low pony tails either side of your head, then plait each one and hold in place with thin hair bands. 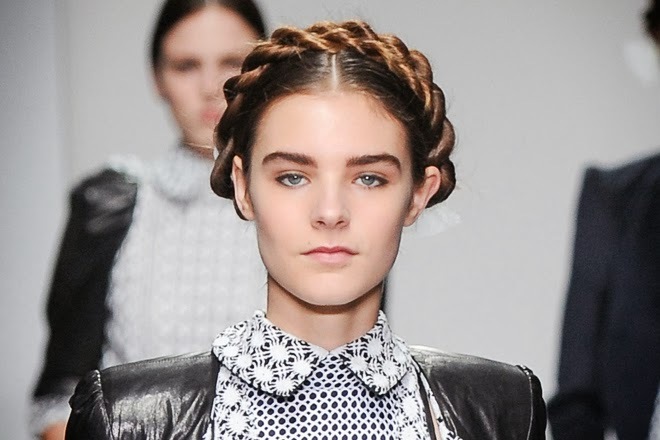 Take one of the plaits and pull it up over the top of your head, holding in place with a kirby grip. Then take the other plait and pull it up over the head behind the first plait already in place and pin into position. To finish, hold the look in place with a hairspray - Cammarano suggests Wella SP Style Perfect Hold. 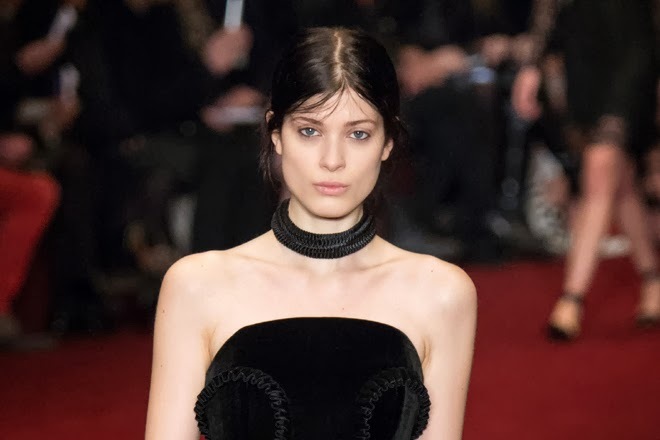 The low ponytail is a catwalk classic and next season Cammarano reveals it’s all about looking ultra-slick and sharp, as featured by the likes of Holly Fulton. Get the look:For a sleek look, a smoothing product is essential to de-frizz and create a super sheen. A light oil such as Wella SP Luxe Oil Light Oil Spray is a versatile product that is perfect for this look – be warned though, only use a tiny amount otherwise your hair will look greasy and feel weighed down. The key is to start small, you can always apply more if necessary. When hair is wet, spray the oil through the lengths of your hair, gently running your hands through to work it in. Next, get your hairdryer and blow dry your hair downwards from root to tip only, to close the hair shaft and prevent frizz. Once hair is dry, run medium-sized straightening irons through the hair to smooth out any bumps. This look requires a deep parting – aim for it to be as low as the bottom of your eyebrow. For best results, use a parting comb for a poker straight finish. Once you have your parting, pull your hair back into a low ponytail at the nape of your neck. Use a thin hair band so that you can then cover it by twisting around a section of your hair and pinning in place. To enhance sleekness and get rid of any flyaway strands, gently run a comb through your ponytail and follow with a final sweep with your straighteners. Nothing says nonchalant elegance better than a messy bun as seen at Erdem; it doesn’t look overdone and it lets the outfit shine through. A messy bun is easier to create (and last) when hair isn’t freshly washed, so leave your hair unwashed for a day. If you can’t bear to go without washing your hair, use a paddle brush to blow dry it before commencing this look. Start by nourishing the hair to encourage movement and shine – mist it with a hair oil such as Wella SP Luxe Oil Keratin Boost Essence. Pull the hair into a loose ponytail – don’t worry about being too neat as this look is all about being ‘undone’. Your ponytail can either be at the back of the head, or to make the look more individual, pull it round to the side and secure with a hair band. Cover the hair band with a small section of your hair and pin in place with a kirby grip. For added volume and messiness, backcomb the ponytail with a brush, then take random sections of the ponytail and pin them into place around the hair band to create a bun. Finish by teasing out a few stray hairs then spray into place with hairspray to complete the look.